One of Europe’s most popular online gambling formats is available on multiple NJ online casinos and at least one online sportsbook. Live Dealer first debuted on Golden Nugget Casino in August 2016, and was later introduced by Betfair Casino. Since, many more sites have begun offering the format, which has become a dominating feature in the New Jersey market. These sites represent the only online options in the US where players can experience the benefits of gambling in a live casino environment, from anywhere in the state. On this page, we’ll explain what this innovative format is all about, and tell you how, where, and when you can get in on the action. 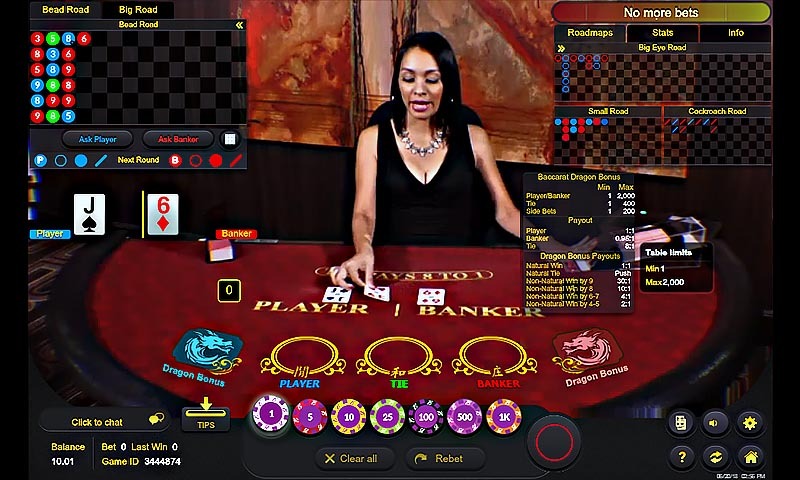 Until somewhat recently, the only way to experience casino table gaming online was by playing against a computer in a simulated environment. Digital table gaming relies heavily upon what is known as a random number generator (RNG), which is essentially a piece of code that produces unbiased and random outcomes. In short, whenever it’s man v. machine, all game outcomes are determined by the RNG. Although this mechanism allowed games to move more swiftly, the social interactivity that players enjoyed in live environments was lost. That, and the RNG-driven nature of the game drew skepticism from some players. Even today, despite regulatory safeguards instituted by legal NJ online casinos to ensure game integrity, some still only fully trust physically dealt cards. For online players longing for these lost aspects of live casino gambling, Live Dealer provides a near perfect solution. The main differences between playing live and in Live Dealer games are that there are no physical chips to contend with, and payouts are handled automatically by computer systems. This allows for gaming rounds to move at a swifter pace compared to live, but still slower than traditional online table gaming. Of course, the other difference is that players can play Live Dealer games from anywhere. Whether it be from their home PC, a laptop, or a mobile device, as long as players are physically located in the state of the New Jersey, they are free to take a seat at the Live Dealer tables. What NJ online casinos feature Live Dealer games? Currently there are 10. Golden Nugget was a Live Dealer pioneer in New Jersey, partnering with software provider Ezugi to open the first dedicated legal Live Dealer studio in the state in 2016. GN-licensee Betfair followed suit, leasing out space from the facility for its own operation the following year, utilizing the same dealers and most of the same tables as Golden Nugget. Several sites licensed under Borgata (Borgata Casino, Party Casino NJ, and playMGM) added to format as well in 2018. The opening of the Hard Rock AC finally brought some competition for Golden Nugget. Hard Rock teamed up with international Live Dealer industry-leader Evolution Gaming to build its own dedicated studio inside the property. Hard Rock got its Live Dealer games up and running soon after it launched its online casino, and later welcomed 888, Play SugarHouse, Mohegan Sun, and Resorts into the facility as well. Ocean Resort Casino has long awaited their own launch of Live Dealer games, having announced a deal with Evolution in the summer of 2018. Even sports betting giant DraftKings has now added Evolution’s games to their app, expanding into casino gambling for the first time in the NJ market. Live Dealer games from these operators are currently available for PC, Mac, and on Android/iOS powered smartphone and tablet devices. What are the advantages and disadvantages of Live Dealer play? At present, all Live Dealer Casinos feature four primary Live Dealer games: blackjack, roulette, baccarat and hold’em-style games. A variety of baccarat and blackjack side games are also available, as is Multiview Roulette — which is really just roulette with a few extra camera angles. Some games offerings vary between the two studios. Casinos using the Evolution platform offer Ultimate Texas Hold’em while those using the Golden Nugget Ezugi studio spread a variant called Casino Hold’em. Each site supports just one baccarat and one traditional roulette table, and that’s all that is necessary. One of the benefits of Live Dealer is that for most games, one table can theoretically host an infinite number of patrons. Blackjack is different, because players of this game are active participants, with each receiving a unique hand, seating is generally limited to just seven players per table. The two studios have each employed their own solutions to this limitation. Wagering and hand actions are done electronically instead of physically. Players have a limited amount of time to make their decisions. The timer was implemented to ensure adequate game flow. Payouts are calculated automatically by a computer instead of the dealer. There are also two side bets available: 21 + 3 and Pair bets. 21+3 pays out when the player’s first two cards and the dealer’s up card make a flush or better. The Pair sidebets varies slightly between Ezugi and Evolution games. Evolution Live Blackjack has an Any Pair sidebet that pays if your cards match rank, with an better payout if they are the same suit. Ezugi’s version has Perfect Pair, which adds a middle payout level if the pair is a matching color. As Live Dealer has grown in popularity, there has been increased demand for blackjack. Ezugi’s response has mostly been to increase the number of tables as they go, but this cannot continue indefinitely Golden Nugget has launched a Live Unlimited 21 Blackjack Auto-Split variant designed to alleviate traffic by allowing infinite players at one table by eliminating some player choice in favor of automatic rules. Hard Rock realized the conundrum before launch, so Evolution built into their Blackjack game a unique solution to avoid overcrowding from the very beginning. This took the form of the Bet Behind feature, which allows both players on the rail and those seated at the table to bet on other players’ hands. The one potential downside is that players will have to trust their horse to make sound playing decisions. Both these solutions essentially eliminate the frustration associated with not finding a seat in the main game by limiting control in different minor ways. Choose wisely. The differences between playing Live Dealer Roulette and roulette at a live casino are nominal. Namely, players won’t be butting elbows with their table mates trying to place bets, as all betting is handled electronically. But what players gain in convenience, they lose in house edge. That’s because the wheel features a zero and a double-zero. When the ball lands on these numbers, even money bets do not return any portion of the wager. As a result the house edge on all wagers is a rather unfavorable 5.26%. Compare this to the European Roulette variants found on most NJ online casinos, where the house edge is 2.70% or even less, depending on the type of wager. Still, players won’t find roulette games in AC where the minimum wager is just $1. So if you’re adamantly opposed to digital roulette games and want to play on the cheap, Live Dealer Roulette isn’t the worst option. For a more visual experience, players are Ezugi-powered casinos are encouraged to check out the recently added Multiview Roulette. 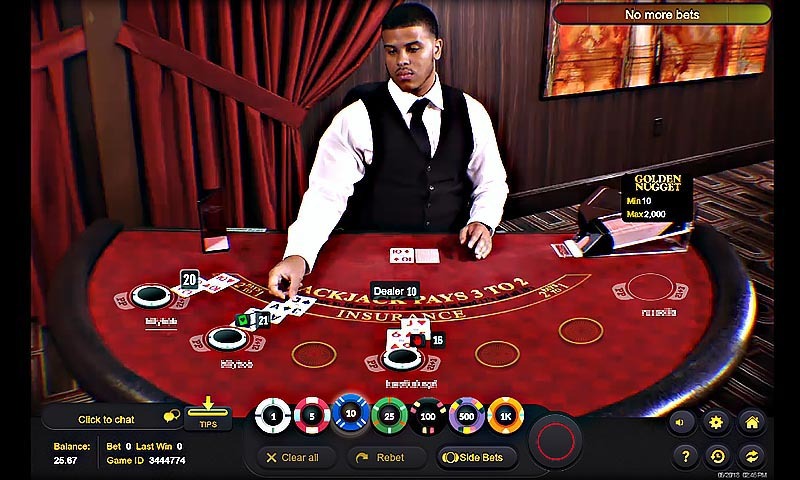 The game mostly parallels Live Dealer Roulette (same dealer, hours of operation, and wheel) except that players are treated to more cinematic camera angles. Those who want to truly immerse themselves in a live casino setting should try Golden Nugget’s Live Casino Floor Roulette, which allows players to observe and place wagers at a real table at Golden Nugget AC casino floor. This is also the first Live Dealer game that runs 24/7. Evolution-powered casinos will soon have access to a similar game called Dual Play Roulette, which may allow patrons even outside the country to wager on spins being made inside the Hard Rock casino. At this time the Evolution casinos also offer a Slingshot Roulette game, which is essentially a non-Live version included in the Live lobby for some inexplicable reason. Outside of the ability to peel the cards oneself, Live Dealer Baccarat is just about identical to its brick-and-mortar counterpart. Well, there is one other big difference: there’s just about nowhere else in the country where players can legally see baccarat hands for a minimum of $1 per hand. The commission on Banker wins is taken because the Banker has a slightly higher probability of winning than the Player. Contrary to popular belief, baccarat outcomes are not truly a coin-flip. Various side bets are available, though they only hurt the expect return which is 98.94% with ideal play. Finally, poker players may get a kick out of the casino poker options, carnival games which effectively place the traditional gameplay in a casino environment. 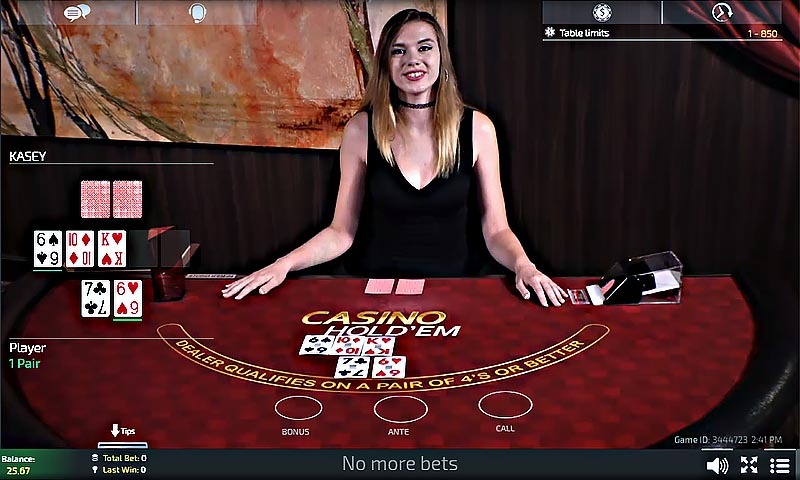 Three such Live games are available: Casino Hold’em from the Golden Nugget studio on Ezugi casinos, and Ultimate Texas Hold’em and Three Card Poker from the Hard Rock studio on Evolution casinos. Put simply, the goal of Casino Hold’em is to make a better five-card poker hand than the dealer. Players place an Ante bet before each round and receive two hole cards. After three of the community cards are dealt the player must either fold and forfeit their Ante, or call and double the bet. After calling the remaining two community cards are dealt and a winner determined. Beat the dealer when she qualifies with a pair of 4s or better and win both the Ante and Call wagers. Should the dealer not qualify then calling players will automatically win on their Ante bet, whether they had the winning hand or not. The game can be played by an unlimited number of players as the player hole cards are shared by all. The minimum bet is $1. The house edge for Casino Hold’em is just over 2%, making it a better play than most Roulette games. There is also a AA+ side bet option that pays when the player flops Aces or better, which has a 6.26% house edge. Evolution’s Ultimate Texas Hold’em functions very similarly to Casino Hold’em. In both games you are making the best five-card hand out of two hole cards and five community cards, comparing to the dealer’s hand. The difference lies in the betting sequence and payouts. The player makes matching Ante and Blind bets. After hole cards are revealed the player can make a Play bet of either 3x or 4x the Ante, or check. If the player checks, after the first three community cards are revealed they can choose to check again or Play 2x the Ante. If the player checks a second time a final choice is made after the last two cards are revealed – either Play 1x or fold the original Ante and Blind bets. The Ante bet pushes if the dealer does not qualify with at least a pair. Blind bets payout high amounts based on the hand, but only with a straight or better. The Play bet pays a simple 1:1. There is also a Trips side bet that pays out on a hand of at least three-of-a-kind. The game has a minimum bet of $0.50, and a house edge of 2.2% on the initial main bet. The Trips side bet has a house edge of 3.5%. This casino poker game compares simple small hands between player and dealer. An Ante bet is made, and you receive three cards. Based on confidence in your hand you can either make a matching Play bet or fold your Ante. The Ante bet pays if you either win or the dealer does not qualify with at least a Queen high. The Play bet only pays if you win and the dealer qualifies, if you win and the dealer has not qualified this bet pushes. Ante bets pay a bonus for good hands. There are also two side bets that offer other scaled payouts for strong hands, a Pair Plus that pays if you have a pair or better, and a 6 Card Bonus that pays on the best five-card hand made from your cards and the dealer’s combined. The minimum bet is $0.50. Three Card Poker has a house edge of 3.4%, with 4.5% on the Pair Plus side bet and 8.6% on the 6 Card Bonus bet.